“Spine-tingling” (Rhythms) and “extraordinary” (Fine Music FM), Chaika employ ethereal harmonies and myriad instruments to create textures inspired by Balkan vibrancy, Turkish markets, Celtic stories, and Eastern Europe’s stunning landscapes. Now releasing their third LP, Chaika’s members individually have written for and performed with truly diverse roster on stages all over the world, including Monsieur Camembert, Riley Lee, and The London Bulgarian Choir. 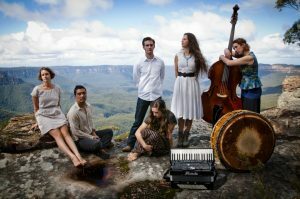 “Enchanting” (The Australian) audiences from folk festivals to the world-class Sydney City Recital Hall, Chaika surprise and move listeners, journeying an unidentifiable era and landscape with music that sits firmly “outside the norm” (Timber & Steel).